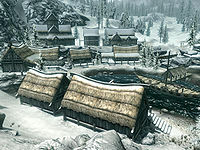 Dawnstar is a city on the northern coast of Skyrim, and the capital of the Pale. It is a fishing and mining settlement which is initially controlled by the Stormcloaks. The residents will report having horrible nightmares, which some initially blame on a witch's curse. It is frequently attacked by dragons. For historical information about Dawnstar, see the lore article. 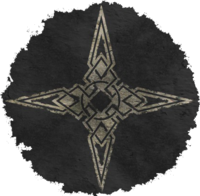 Dawnstar Sanctuary is a house granted upon completion of the Dark Brotherhood quest Hail Sithis! The Quicksilver Mine is located just to the left of Fruki's House (when facing it), in the upper left hand corner of town. The Iron-Breaker Mine is located to the left of The White Hall (when facing it) at the far end of town. A blacksmith's Forge and Hide Tanner are at Rustleif's house in the northwest, by the water. Dawnguard adds a permanently disabled map marker for Dawnstar Docks. Ahkari's hidden merchant chest is located in Dawnstar and is accessible due to a bug. See Ahkari's page for details. A tent can be found northeast of town, past the hill on which the lighthouse is situated. Inside, someone has set up a lovers' retreat, complete with two (unowned) bedrolls, a few articles of clothing, wine, flowers, and an amulet of Mara.